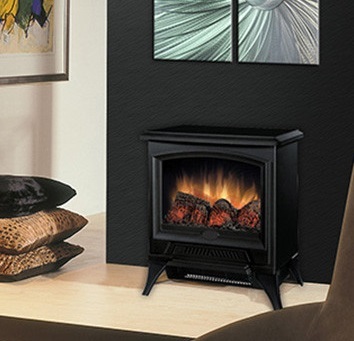 A Charm reminiscent of the wood stoves of the past The Tristan compact electric stove from Dimplex delivers a classic picture frame front and patented flame in a small package. No need to worry about chimney fires, expensive fuel and messy ashes of a real wood stove. With the Tristan, you just place it where you want and plug it in to any standard household outlet. This makes it perfect for use in sunrooms, offices, family rooms or anywhere you need additional heat. Equipped with a powerful fan-forced heater, you can reduce your central furnace temperature and cut your heating cost. The Tristan’s traditional aura is enhanced by the realistic matte black finish, damper-look slots and subtle metallic highlights. You will appreciate the Tristan’s powerful heater on chilly nights; it can warm a room up to 400 sq. ft. and stays cool to the touch so children and pets stay safe. You can also use this stove without the heater for year-round enjoyment. This Compact Electric Stove gives you traditional stove warmth and ambiance on a smaller scale. 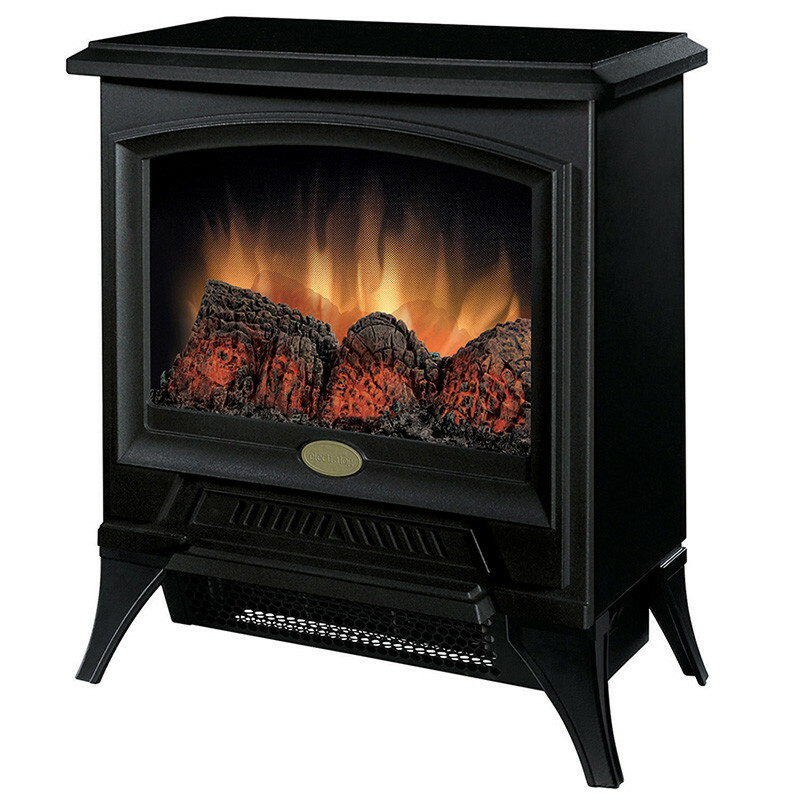 This 17.5 inch wide, 21.75 inch tall and 12 inch deep stove has the life like flame effect. Quiet, fan-forced heater with Hi/Lo settings for even heat distribution and the flame operates with or without heat. The cost to operate is 1 cent per hour with flame only and 8 cents per hour with flame and heat. It comes fully assembled. The patented 3D effect gives the fire its depth and dancing flames. This electric fireplace uses 90% less energy than gas fireplaces to produce visual flames. No combustion means no greenhouse gasses. Dimplex stoves add a charm reminiscent of the wood stoves of the past. Discover our range of styles and colors that are sure to accent the favorite corners of your home. Realistic Flame: Dimplex invented the modern electric fireplace and continues to innovate exclusive technologies that dazzle the eye. Only Dimplex delivers maximum realism with its world-leading flame technology. With the most realistic flame on the market, Dimplex provides a soothing atmosphere with or without heat for year-round ambiance. Superior Quality: The Tristan’s premium construction, with tough steel sides and durable finishes ensure long product life and protect your investment. Hand crafted log set, unique to each unit, adds an extra touch of authenticity. Operates for Pennies a Day: The CS12056A costs only 1 cent per hour with flame operating, 9 cents per hour with both flame and heat (based on average national residential electricity rates). Easy Set-Up: The CS12056A is delivered completely assembled; just place it where you like and plug it in. No venting or piping required, just plugs into any 120 Volt outlet. Easy to move from room-to-room or transport if you move! Reliable Safety: Tempered front glass always stays cool to the touch - enjoy the stove ambiance without risk of children or pets getting hurt. No dangerous combustion or harmful carbon monoxide. UL approved for use in Canada and the U.S.
Environmentally Friendly Operation: The CS12056A is 100% efficient and produces no carbon monoxide or other emissions. An economical and Time- saving Alternative to Wood, Gas and Gel Stoves: Unlike wood and gel stoves, there’s no mess with the CS12056A and no worries about running out of fuel or having to buy expensive wood or gel. Gas and wood stoves both require disruptive venting and expensive installation. With the CS12056A, you just plug it in. Warranty: The CS12056A is covered by a 90-day warranty on parts. Dedicated Customer Support: The friendly and knowledgeable Dimplex support staff are trained in diagnostics and available to help should you ever require assistance. North American Design and Engineering Excellence: The Dimplex in-house staff of engineers make sure all products meet customer expectations by being well made, easy to assemble, simple to operate, and a pleasure to own. Quality is designed into Dimplex products at every stage of the development process and is ensured by detailed inspections throughout the production cycle.